Obituary – Cress, Sherry Marie « Perry High School Alumni Association, Inc.
﻿Band 47-49, Junior Play 48-49, Senior Honor Society 48-49, Teen Town Council 48-50, Y—Teens 47-48, Home Room Parliamentarian 46-47, Annual Staff 46-47, Library Staff 49-50, Football Queen Attendant 47-48, Football Queen Manager 46-47. Funeral arrangements were pending Thursday at Parker Funeral home for Miss Sherry Marie Cress, 45, 1709 North Eleventh Street, who died at 3:45 a.m. Thursday at Presbyterian hospital at Oklahoma City. Miss Cress was taken from her home to Presbyterian hospital by Perry fire department ambulance at approximately 10 p.m. Wednesday. Born Feb. 8, 1932, in Perry, Miss Cress was the daughter of Mrs. And Mrs. Paul W. Cress, 1709 North Eleventh. She was a Perry high school graduate and attended the University of Oklahoma and Oklahoma City University. 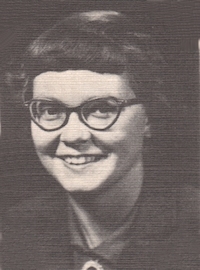 Miss Cress was an active member of the United Methodist church of Perry. She also was active in the local Camp First program, having served as civic camp director in 1952, Camp fire registrar and an executive director. She was employed at Southwestern Bell Telephone Company in Oklahoma City, 1951-52 and served as a volunteer occupational therapist at the Veterans Administration hospital at Oklahoma City in 1951. 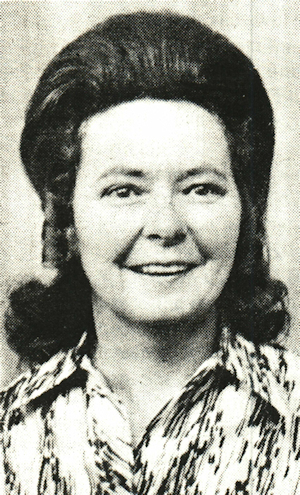 Miss Cress was employed as a social director at Green Valley convalescent center from 1967-73. She was a certified water safety instructor and was a tennis instructor in the Perry community. Miss Cress was a member of the Daughters of the American Revolution. In 1965, she was recognized in the Outstanding Women of America publication. Among survivors are her parents, Mr. and Mrs. Cress, and her grandmother, Mrs. P. W. Cress, 1715 Parklane.